Horncastle county councillor Bill Aron has vowed to back residents fighting to save bus services under the threat of the axe. Cash-strapped Lincolnshire County Council admits it is looking at the viability of more than 160 services as it looks to save millions of pounds. Several routes - including ‘Call Connect‘ - are in Coun Aron’s ward which covers Horncastle and many Wolds villages. 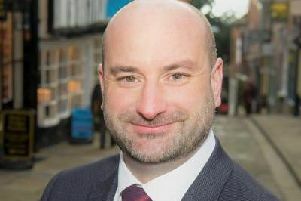 Coun Aron said he had attended a meeting of residents from Tetford to hear their concerns and urged them to raise issues at a meeting in Louth which featured county council leader Martin Hill. Coun Aron explained: “Residents had serious concerns about the future of rural bus services. “I did stress that no decision had been made and that the county council is asking for as many views as possible. “I also suggested they (the residents) went to the “budget” meeting so they could raise concerns with Coun Hill. “He commented that the Tetford contingent made the Louth budget meeting the best attended so far. Coun Aron explained residents had admitted some rural services were running with low passenger numbers. He said no firm decision on the future of individual services was expected until later this month. He added: “I’m sure the county council will also be looking to cover as many communities as they can - and especially for people without their own transport by providing ‘Call Connect’.